Salman Khan's nephew Ahil turned two-years-old on March 30 and the Khandaan partied hard with the toddler in Abu Dhabi. 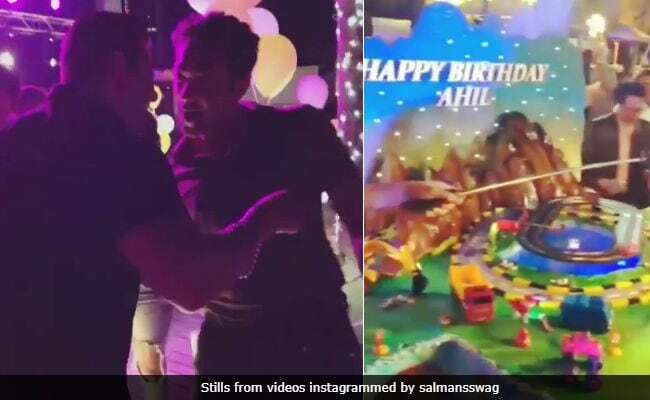 Salman Khan is currently filming Race 3 in Abu Dhabi and the 52-year-old actor's entire family joined him there to celebrate Ahil's birthday. Salman Khan's Race 3 team also partied with the actor and his family. Fan clubs shared pictures and videos which gave a glimpse of all things nice from Ahil's birthday party. Ahil's birthday cake was grander than anyone could have imagined. Then there was Salman Khan and Bobby Deol dancing to Diljit Dosanjh's Do You Know and Aripita and Jacqueline recreating the hook step of Jumme Ki Raat. On his second birthday, Ahil was surrounded by his family members aunt Alvira and her husband Atul Agnihotri, grandparents Salma Khan (Salman's mother) and Anil and Suneeta Sharma (parents of Aayush Sharma), cousins Ayaan (son of Alvira and Atul), Nirvaan (Sohail Khan's son) and Arhaan (Malaika and Arbaaz Khan's son). Salman Khan's Race 3 team is filming some superb action sequences in Abu Dhabi. Apart from Salman, Jacqueline and Bobby Deol, actors Anil Kapoor, Daisy Shah and Saqib Saleem are also there. Race 3 is directed by Remo D'Souza and it is expected to release on Eid this year.